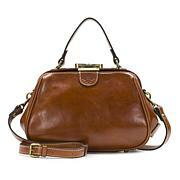 Inspire your style with this luxe leather frame satchel. 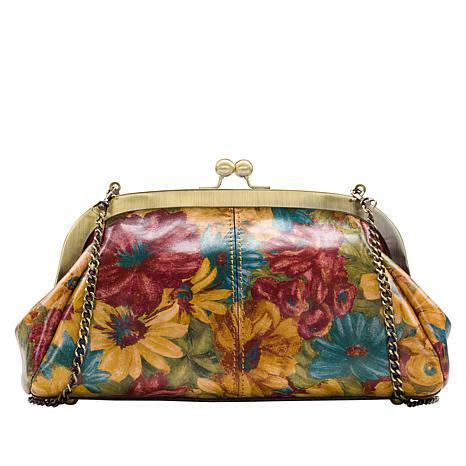 The Mia by Patricia Nash is a vintage-inspired, versatile bag with bold metal detailing, a detachable chain-link shoulder strap and protective metal feet. It's just the right size for quick trips or evenings out. I received the rose garden straw bag. Its so pretty and so spring!.. This will be great for any special spring/summer occasion. Perfect for garden parties. 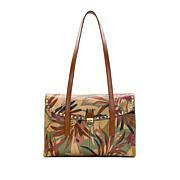 I love this beautiful spring bag - I get a lot of compliments! There is actually quite a bit of room in this bag, I love that I can use as a satchel or clutch. The kiss lock frame is super easy to use. I bought the mint and the pink bags. The colors are gorgeous as is the tooling. You cant use the chain strap as it gets caught in the closure. Im keeping both my bags and might buy a third anyway! The Mia is my favorite, simply elegant just like 1940's fashion. Well made with enough room for all the necessities. I could smell the leather all day - it reminds me of my trips to Italy. Patricia, don't stop offering this style - I want to collect a few more!